It seems that Spring has finally arrived! The good news is that you will no longer have to endure my moaning and groaning about the bitter cold. Spring is my favorite season as it's usually the perfect weather when it's not raining to water the thirsty new buds on the trees- "April Showers Bring May Flowers" you know. I don't know about you but often when a new season arrives I go a little bit crazy with all of the exciting new collections arriving in stores. So I like to separate the "wants" and the "needs" and splurge a little within my budget at the same time. A wish list is a great way of keeping in check especially in the Spring time when all of these gorgeous bright colors, light pastels and floral things are calling my name! I thought I'd share some of the things I have been eyeing lately from some of the categories I love- beauty, fashion, cooking and decorating. 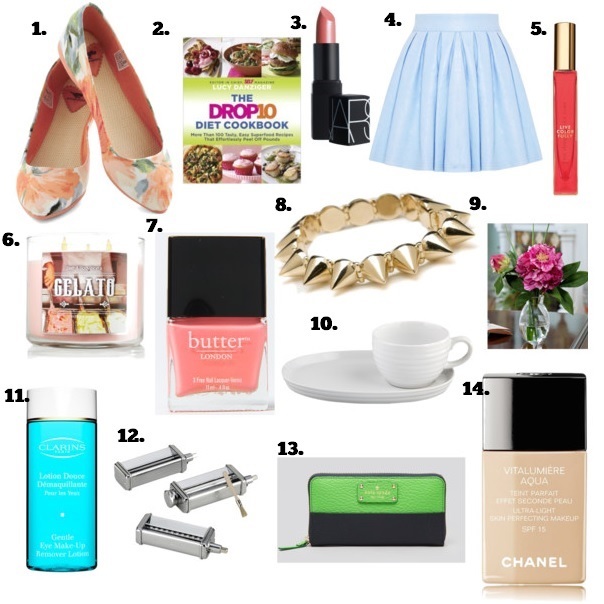 I haven't done a wish list post in a while so I have quite a few items to share. 1. Modcloth Pointing the Way Flats in Floral-how gorgeous are these colors they just scream perfect springtime accessory to me. I think they will add a little something to any basic outfit! 2. The Drop10 Diet Cookbook By Lucy Danziger- I'm not a constant dieter but I do try to be healthy as much as possible. From time to time I do like to do a little diet to get myself back on track I've gained a bit. My husband and I are doing a little Spring dieting together as well as exercising to get into shape for Summer. I have picked up a few great cookbooks in the library with 500 calorie meals etc. to aid the process but this one looks like a great one to own. 3. Nars Lipstick "Pago Pago"- I have heard such fantastic things about the Nars lip products and have yet to try one for myself. I hope to get to a Sephora sometime soon and change that. 4. Alice+Olivia Sky Blue Box Pleat Leather Skirt- I love my colored skirts for Spring and Summer and with leather still being so hot in the fashion department this is a piece I adore. My closet is full of flattering pencil skirts so I want to break off from that a bit with a high waisted flared look. The price tag on this one is outrageous though so I'll try to find a less expensive option first. 5. Kate Spade New York "live colorfully" perfume roller ball- I have a serious love for all things Kate Spade with everything being so vivid, colorful and super trendy! I sampled this from a magazine recently and I really found the citrus accents to be nice. I switch up my perfumes often so I like to have an assortment of roller balls rather then larger sized bottles that way I can also easily carry them in my bag. I then purchase a large size once in a while of the ones I am crazy about. 6. Bath & Body Works 3 Wick Candle "Gelato"- If you are a frequent reader of my blog you will know how much I love burning candles. I used to limit that to a winter time routine though. Recently bath and body works has come out with several Spring and Summery scents for their 3 wick candles and I will be sure to stock up very soon. And hey who doesn't want to burn a candle that smells like ice cream this time of year? I sure want to! 7. Butter London Nail Polish in "Trout Pout"- I confess I am quite the nail polish collector. I have so many but I can't stop buying them. There are so many brands and colors to choose from and then there's glitters, metallics etc. Most of the ones in my collection are from Essie, O.P.I and China Glaze as they are decently priced but I have seen several gorgeous colors from this Butter London line and hope to try a few. There is one shade I don't have too much of and that is coral. So this is one I need...ok want. 8. CC Skye Mercy Gold Spike Bracelet- Spikes are all the rage lately in all colors. You'll find them on shoes, on blouses and then there's the jewelry. I've been wearing alot of the gold shade with my jewelry lately and I think this would be a lovely addition to my collection even though I don't wear bracelets too often. The price is a bit steep on this one so I will be on the search for something a little cheaper for now. 9. Silk Peony Arrangement- I love having flowers in a vase at the center of my kitchen table. It really brightens up the room. My husband will often come home with a bouquet for me for the weekend and that is just amazing but fresh flowers, although beautiful die pretty quickly. So I have been on the search for a silk flower arrangement that is very real looking to place on my table as a centerpiece. I think this one is what I've been looking for. 10. Brunswick 2 Piece Soup & Sandwich Set- Something you may notice with my recipe post photos is that I like a simple but modern look for my dishes. So basic white is what I go for a lot. I really love the look of this set and I think it would be a great item for food blogging. I am always on the search for nice inexpensive dishes and accessories to beautify my recipe posts. 11. Clarins Gentle Eye Makeup Remover Lotion- I have not yet tried any products from Clarins but have heard some pretty good things. I have mentioned my eye makeup remover dilemma plenty of times and I have still not found the most perfect one. I read a great review on this product recently so I think this is going to be what I turn to next. 12. Crate & Barrel KitchenAid Mixer Pasta Roll Cutters Attachment- I love pasta. I could easily eat it every night but I don't. I usually just use the dry boxed stuff from Ronzoni but on the rare occasion that I have loads of time on my hands I'll prepare a batch of homemade pasta which is so much better. The process would be made so much quicker with an attachment like this for my Kitchenaid mixer. 13. Kate Spade New York Grove Court Wallet- I've been on a green kick lately- green nails, shoes, dress I love it all. I'm in need of a new wallet and how amazing is this Kate Spade one? It comes in yellow too- also really nice! 14. Chanel Vitalumiere Aqua Foundation- Between beauty channels and blogs this is a most talked about face product. I thought it may have been a brand name kind of hype but then I received a sample of it with a magazine and it amazed me! I had about 3 uses from it but it gave great coverage, felt like nothing on my skin and didn't cause any irritations. It is definitely a pricey/luxury item and that's why it has made the wish list. It'll have to wait for a special occasion gift to myself most likely. What have you been wishing for with the onset of Spring? Let me know in the comments form below- I love to hear from you! P.S. This weeks Youtube video was a step by step recipe for my amazing Sesame Chicken go check it out here if you would like.